The first kit you'll receive is the Welcome Kit, shown below, and it includes a free gift - a clear acrylic block. 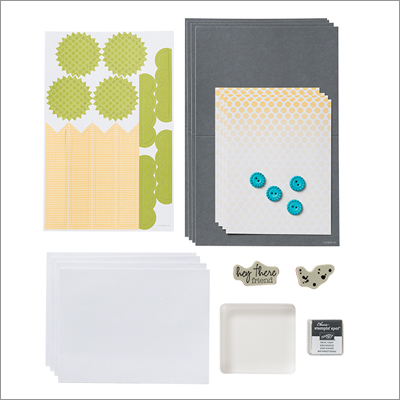 Each kit, thereafter, includes stamps, ink, paper and accessories - everything but adhesive. It's all color-coordinated, measured and precut so all you have to do is sit down and treat yourself to a 30-minute creative escape. Head on over to My Paper Pumpkin and sign up today. A Paper Pumpkin membership is $19.95 per month and shipping is included! If you have any questions about My Paper Pumpkin, please be sure to let me know. You can always e-mail me at marsha@coffeepotstampingcafe.com. Tell them Marsha sent you.